Showing results for tags ' 500'. Bought a new carberator for my 1999 Sportsman 500. Very excited when it finally started running right & then I put on the air box . . . dogs and can't use more than 1/2 throttle. I've torn it apart, rechecked timing, rechecked valve clearances, checked screw positioning in carb as well as several other little things (like spark plug, etc). This is very frustrating as everything is as it should be. Runs awesome without the air box! But as soon as it's put back on . . . it's back to junk! Very frustrating. Anyone with a suggestion would be greatly appreciated. Blows out black smoke when you rev it up how do you adjust the carb? I have a 2003 predator 500 that is a real pain to get started when cold. If I can get it started at all. It has spark, is getting fuel, and cranks like normal. I have disassembled and cleaned the carb. Have also tried switching out the carb. No noticeable change in attempting to start. Have swapped out spark plug and made sure the gap is set correctly. Have looked at fuel pump and appears to be in working order. Have taken to air tube off and noticed a lot of back pressure out of carb. Does anyone have any advise for me or come across the same symptoms? My 2005 Arctic Cat 500 started leaking fuel from the top right hand side of the carb. It looks and feels that the fuel is coming from under the throttle cable housing area just above the primer pump. I have not had time to take carb off. Has anyone had a leak on this side and area of their carb? I am working on a 500 that seems to have me stumped. The quad will start but will only run if I keep pumping the throttle. It smells like it is getting way to much fuel and the plug is always wet when I take it out. I took the carb apart and cleaned it really good twice. Still the same problem. So I swapped the carb with another working quad. That quad runs fine with the carb but the problem quad still runs the same. I swapped the coil this did not solve the problem either. I also checked the timing with a timing light and it seems to be good. I am not sure what I am missing. Any ideas? 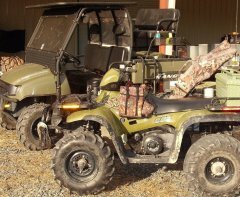 1999 polaris 500 sportsman grinding in 4 wheel drive ? I was just wondering if anyone had any tips on removing and installing swing arm bearings on my 05 vinson 500. I have not done this before and looking for a little help. Thank you in advance. By the way I am new to the site. 1998 Polaris 500, clutch is rubbing the shroud? I have taken the cover off and don't see why, but it rubs the shroud/ belt guard at a low idle, there is a small hole starting to rub thru it? Arctic Cat 500 2006 "BELT"
"Belt" message appeared on console screen. Does that mean a loose belt and either needs tightening or replaced? I kept going and turn off ignition. Could not start again. Not even a grunt, new battery. Partner jumped and I was able to do all my errands and drive home. (Total 2 hours). Battery still dead. What am I looking at as to possible diagnosis and corrections? while running the display on my 2005 500 cat will work and than stop and start working again whhile running. dont know what is causing this to happen. I am new to this awesome site and I was wondering if some one could help me. I have this sportsman 500x2 efi. I used it last summer and fall around the house and all was good. I just opened my garage door to some spring cleaning so I started the quad up to let it run for a bit. It ran for about a minute then stalled out I tried to restart it and it would run for a second or two then stall. Now it will not start at all. The gas is still good the plug was a little black it has spark. Any idea's ? it all started with the the negative terminal buzzing when i try to start it. in attempting to fix that now when i turn my lights on, on the four wheeler all power is shut off. will still pull start but would like to have all issues resolved. any ideas? My normally problematic to start 05 500 4x4 (carb/fuel issues) has been fine the last couple months after tearing down carb and cleaning again etc.. It has turned very cold, I have been running it every 5-7 days and it has been starting. Need it BADLY BADLY right now, snow storm is almost here, and now no start. It is much colder than usual. Can someone tell me how I might try to start it?? I did not try starter fluid, I don't know where to spray it?? Air intake?? But not sure where that's at? Sad I know, I don't maintain it myself. If someone can help me I would appreciate it. Thanks. My 2004 polaris scrambler 500 started to backfire ,then i was able ti limp it into the driveway and it died . I tried to start it but when i turned the key there was no power to the rest of the quad . my winch still worked but its wired straight to the battery . I had noticed a sound coming from the sylenoid by the battery during previous times i started the engine but then i would turn off the head light and it would start fine . I replaced that but still no dice with the rest of the system . Anyone else ever had this problem ??? Hello everyone... I just purchased my Polaris Sportsman 500 and while riding the other day I went over bump and lost all lights, including speedo/shift indicated gauge and also electric fan that comes on when I turn key to on. Thanks for any help in advance! I am looking at buying a 04 Sportsman (the ATP) model and I noticed when checking out the bike that there is some slop in both front axles. Not directly in the u-joint but where the yolk exits the transfer case there is some play. There is no leakage of fluids but I am wondering if it's normal to have some amount of play here? The bike has 1600 miles on it.